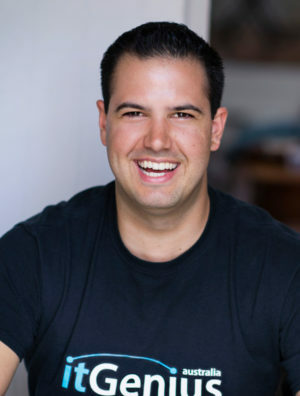 A leading expert in small business cloud computing, Peter Moriarty was ranked as one of Australia’s Top 10 Entrepreneurs Under 30 four times by SmartCompany and Australian Anthill publications. As founder of itGenius, Peter’s advice on business cloud technology has been featured in publications including the Sydney Morning Herald, The Age, Australian Financial Review and Sky News Business. Growing up in rural NSW, Peter started IT consulting at the age of 15, distributing flyers with the help of his trusty pushbike. Since then, he has maintained his passion for technology, growing itGenius into a full-service IT consultancy which serves thousands of businesses across Australia. Today, itGenius is the leading Small Business Google Cloud partner in Australia. Together with his team, Peter helps businesses implement simple technology which allows them to work anywhere, at anytime, on any device. itGenius has worked with some of Australia’s most well-known brands and organisations, including the NSW Government, Fairfax Group and Canva. The team’s biggest achievement is helping thousands of primarily small to medium sized businesses to collaborate more effectively with Google’s suite of business productivity tools. Personally, Peter is on a crusade to realise his dream of helping as many people as he can to embrace technology as a tool to improve their lives. When not working, he’s either travelling, 4WDing, cycling or riding a motorbike somewhere where there’s sunshine!